People are not born more open (or not) to change. That’s a wrong assumption most of us make — we think other resist change on purpose. Mental states are fluid. We can all train our minds to overcome resistance. You can’t expect someone to run a marathon without any previous training. Those who are out of shape, not only can get harmed — they will resist the idea from the get-go. However, that’s how many organization approach change. They expect people to embrace new technologies, initiatives or strategic directions with excitement — but they forget to prepare them to be more open-minded. Swiss Psychologist Jean Piaget coined the term ‘Schema’ to describe both the mental and physical actions required in understanding and knowing. We use them to interpret and understand the world — schemas are the building blocks of knowledge. When we face new information, we have to either fit it in our existing mentality or to adjust our schema to fit the new information. We can either assimilate or accommodate to what’s unfamiliar. Assimilation is easy — the new information fits within existing experiences and preconceived ideas. But, when there’s no place for it, it challenges our beliefs, emotions, and confidence. Accommodation is hard — it requires to develop a cognitive ability. We have to put judgment aside and be willing to analyze the new information as ‘potentially good.’ Once we recognize the benefit of a new initiative, it requires challenging our existing ideas — accommodation requires training our minds. Note: the FEAR to DARE framework was adapted from the one Acceptance and Commitment Therapy (CBT) uses for psychotherapy; ours has been repurposed for team and organizational transformation. F is for Fighting. Most of us are at war with reality. We fight what we can’t control or don’t understand. Our anxiety, emotions, and thoughts prevent us from fully understanding ourselves, others, and the context. Low self-awareness causes blindspots, thus bad clouds our judgment to make decisions. E is for Excuses. When things don’t go as expected, we tend to blame others. Excuses are distractions — we put the focus somewhere else instead of being accountable for our acts. Name your favorite excuse. We play the blame game instead of acting. A is for Avoidance. Change challenges us — we must leave our comfort zone to try new things. Our perfectionist mind tends to focus on what’s missing instead of what we have. We are busy, others teams have more budget, our competitor is faster than we are, you name it. Constraints become a limitation — we avoid the real challenge. R is for Repetition. Avoidance of uncertainty keeps us in our comfort zone — we keep doing the same things in the same way we always did. We end living on autopilot. So, how can you break this cycle? Work on you. Be honest. Be authentic. Be brave. Dare to change. D is for Discovery. We must pause and reflect to increase our self-awareness. We put the time and effort to discover who we really are and become compassionate enough to accept our entire self (flaws included). We don’t let our thoughts and emotions cloud our judgment — we discover reality as is. Self-aware teams make better decisions, interact better with each other, and manage conflicts more effectively. Discovery is an ongoing process — self-awareness turns our blindspots into bright spots. A is for Autonomy. We take ownership of our actions. Rather than blaming others, we take full accountability. Autonomy is our desire for choices — we want to manage our destiny, rather than leaving it in someone else’s hands. Our brains are wired to self-direct. We need to feel autonomy over our tasks (what we do), our time (when we do it), the team (who we do it with), and the technique (how we do it). Autonomy lets action, not excuses, drive us. R is for Reframing. Limits, just like fear, are an illusion. We are wired to believe that having more (time, resources, budget, etc.) is what matters. Reframing is how we turn limitations into our best friend — they force us to be more focused, creative, and effective. 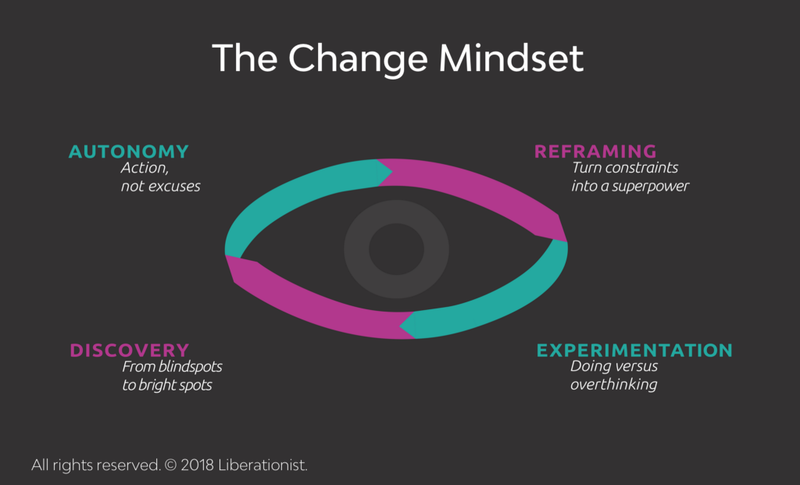 Reframing turns constraints into a superpower. E is for Experimentation. Letting go of what we go is the first step to try new things. To learn something new, you must unlearn everything you think you know. It requires to embrace vulnerability — get used to making mistakes and recover from failing often. Put your perfectionism aside. Be okay to jump into the unknown. Experimentation requires to embrace doing over overthinking. To move from FEAR to DARE a framework is not enough — it requires training, coaches, tool, and practice. But, above all, you must create the right conditions. Here are some easy tips to get you started. Our mindsets and emotions can make things look more complicated or challenging than they are. Self-awareness helps us understand our feelings and thoughts — we observe events instead of reacting to them. By looking at our thoughts rather than through them, we can see reality as is, not a distorted version. Progress fuels more progress — quick wins accelerate change. “What’s your mistake policy?” — I like to ask my clients. This kickstarts a healthy conversation on how organization deal (or not) with errors. To learn, you must fail first. Encourage a culture of risk-taking — celebrate mistakes as lessons. Download my ebook Stretch Your Team: how to thrive in a changing world: get your free copy.